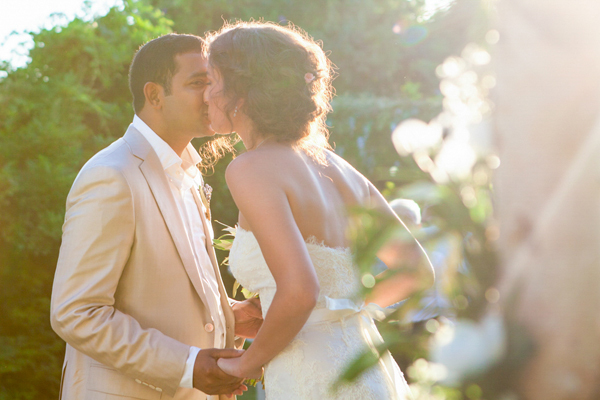 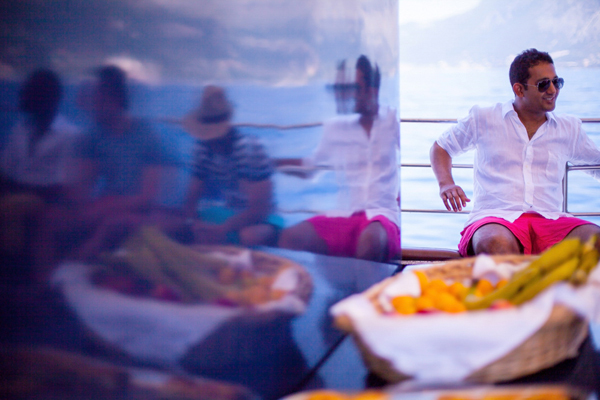 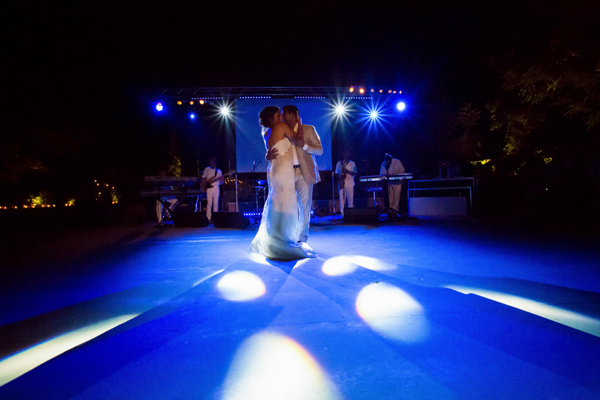 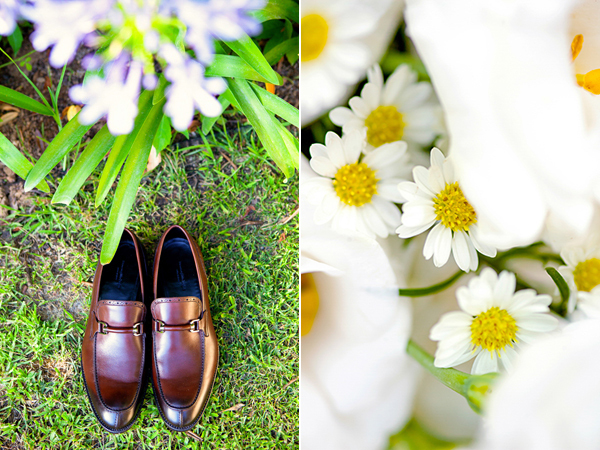 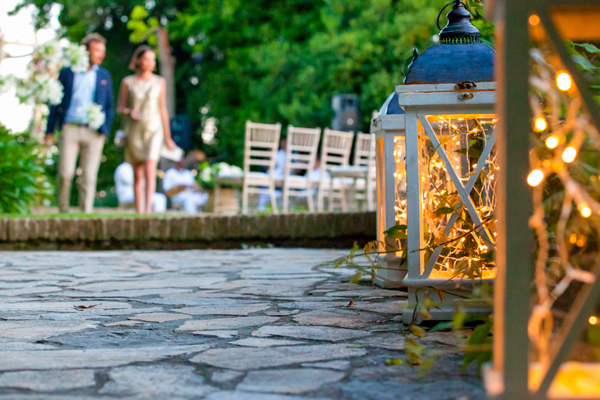 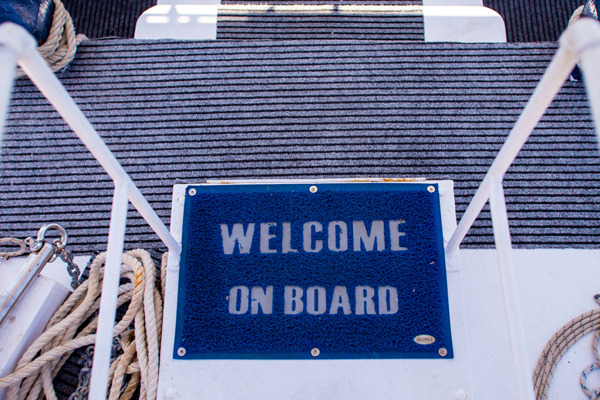 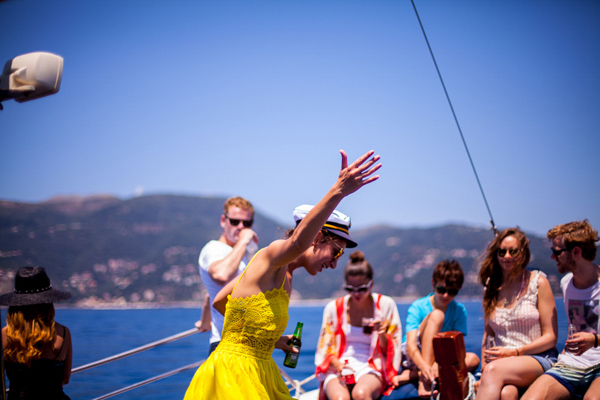 The destination wedding in Corfu you are about to see is flowing with romance and wedding decorative details to die for! 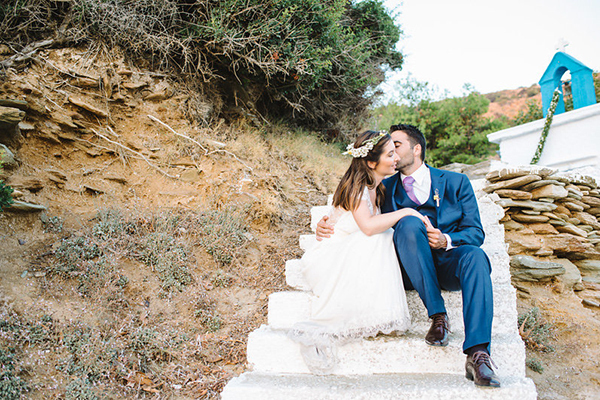 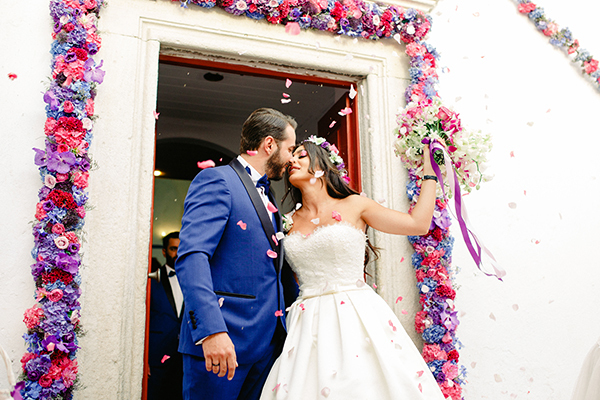 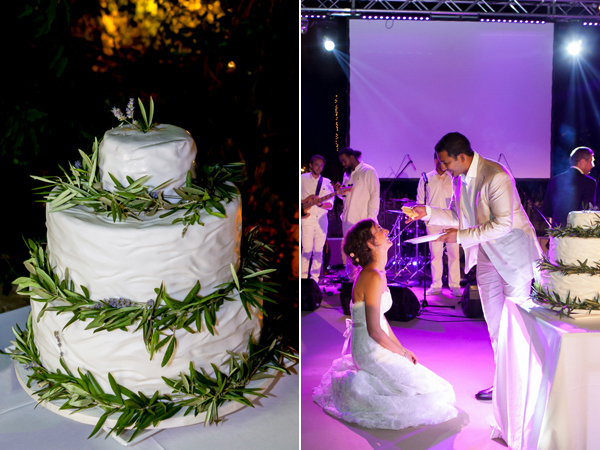 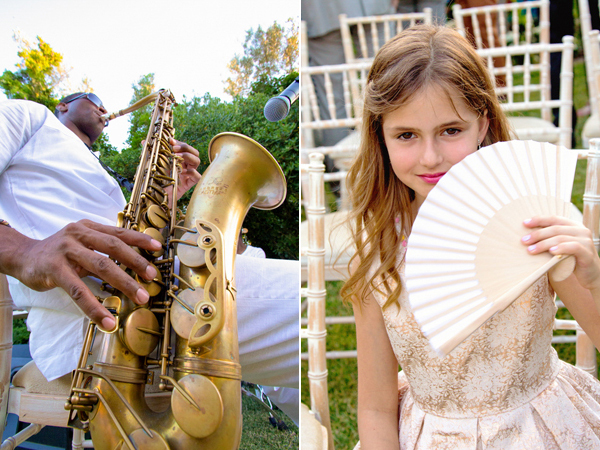 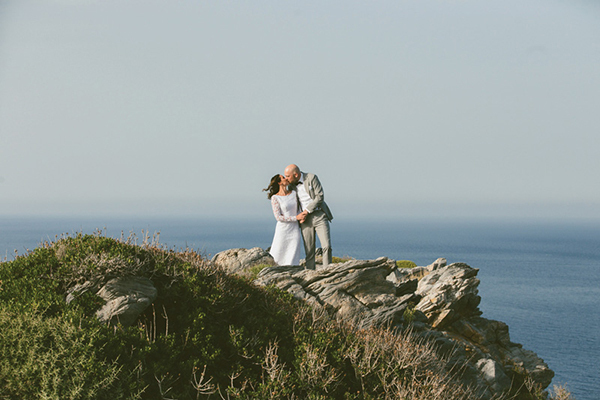 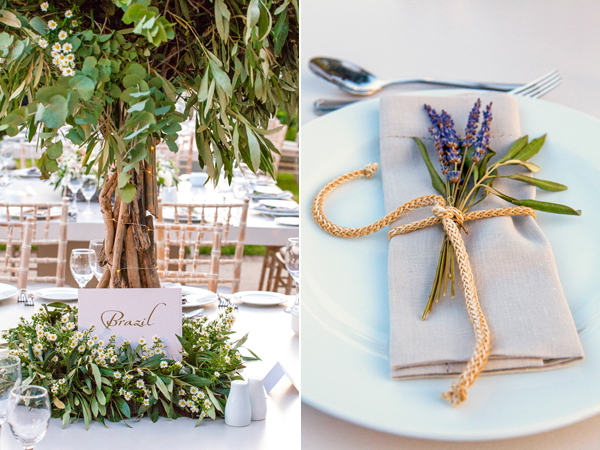 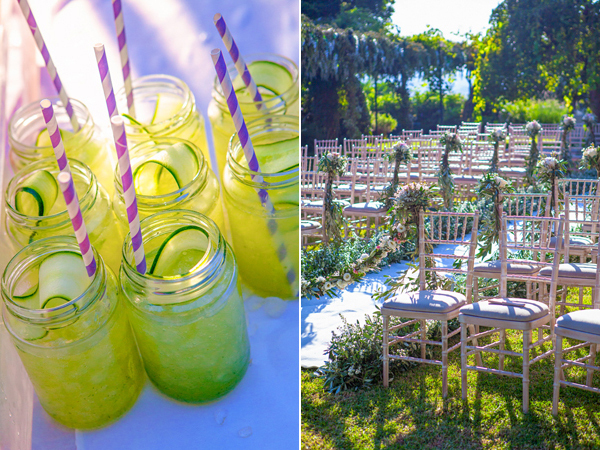 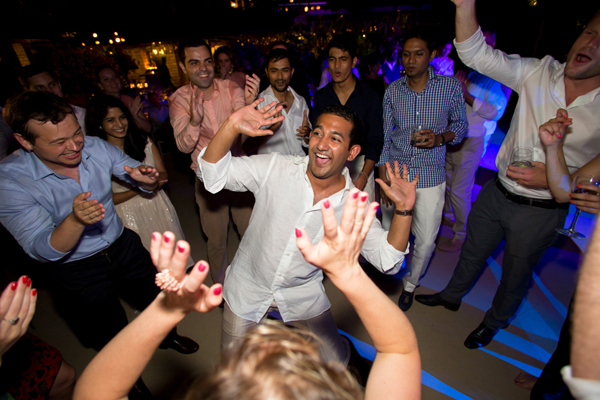 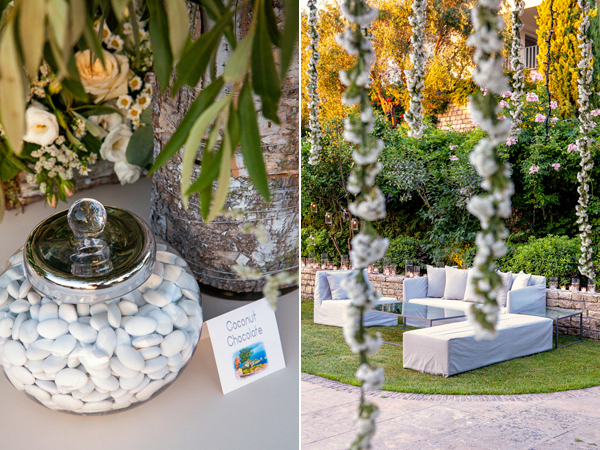 Captured beautifuly by Penelope Photography every square inch of this stunning and sophsticated Greek island affair has filled our screens with so much gorgeousness planned with perfection by The Event Company. 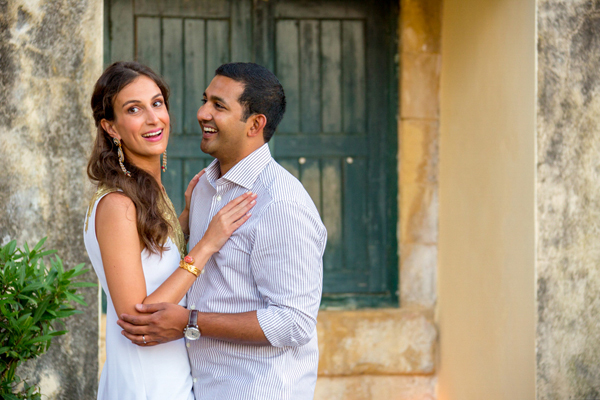 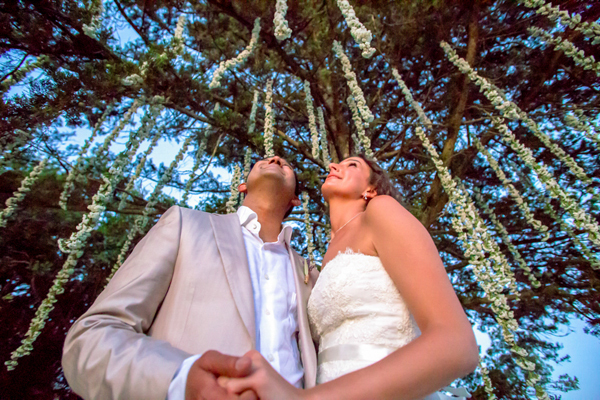 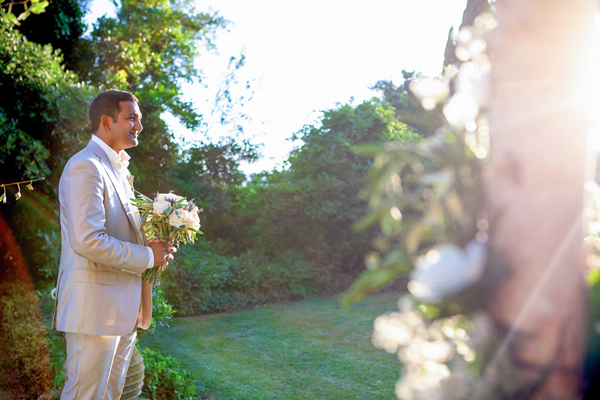 Katie and Roubesh decided to get married in a private villa on the island of Corfu, a breathtaking location with beautiful emerald waters. 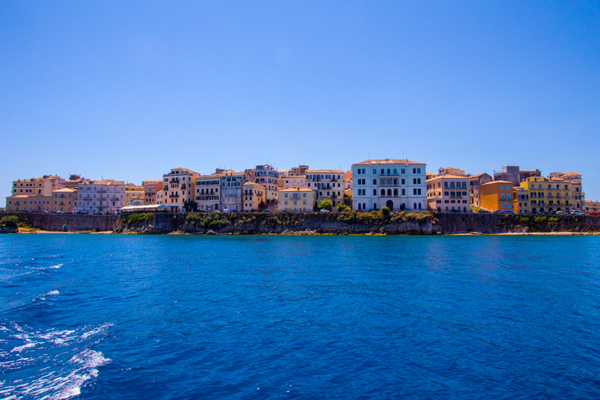 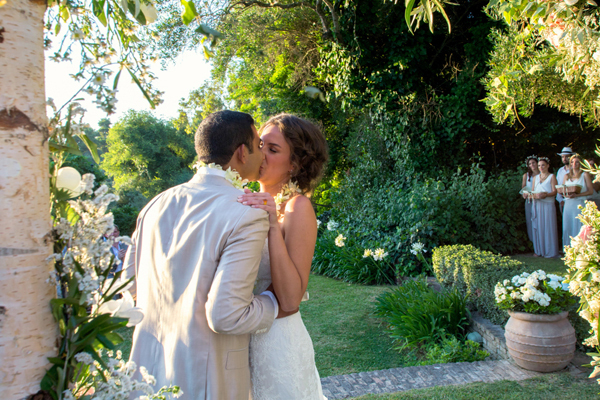 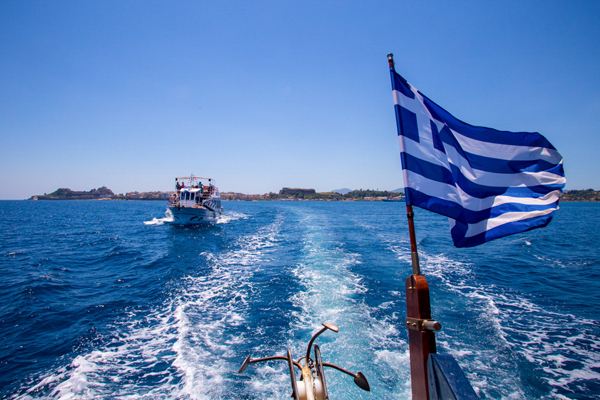 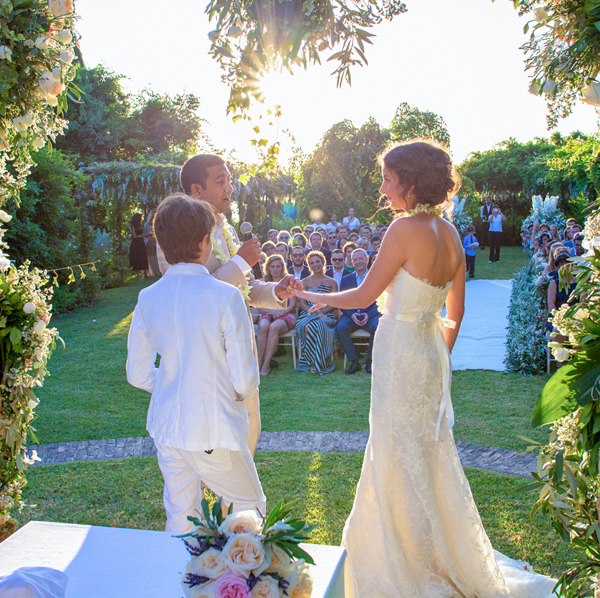 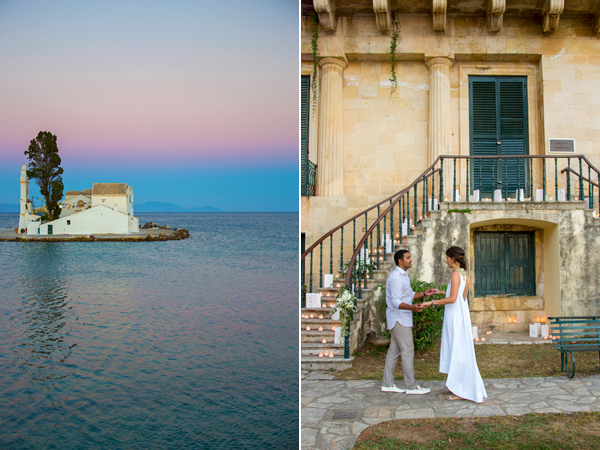 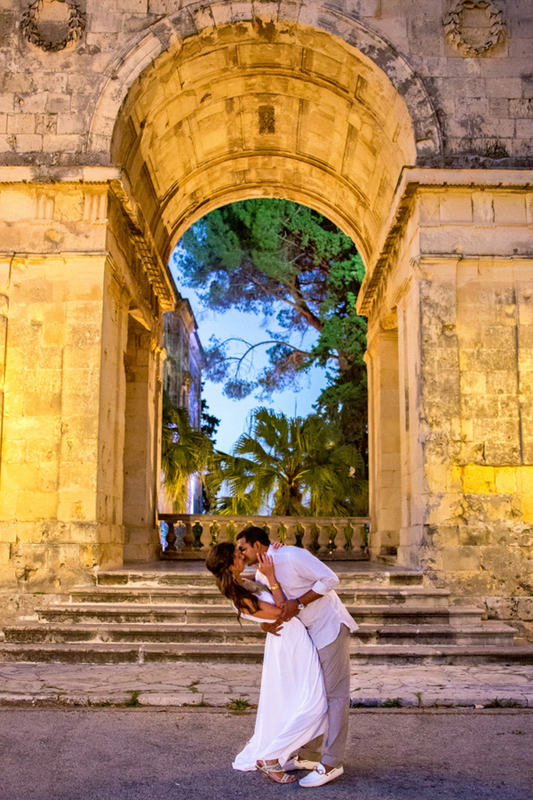 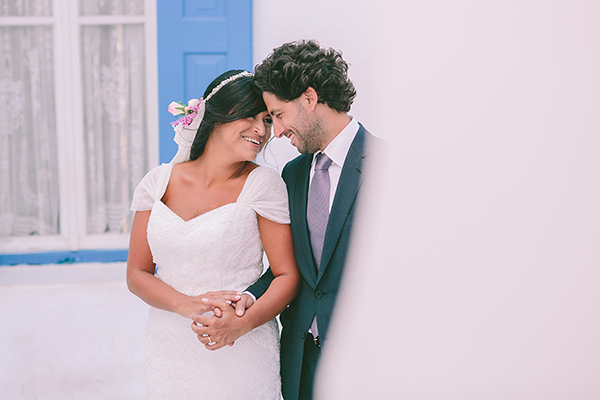 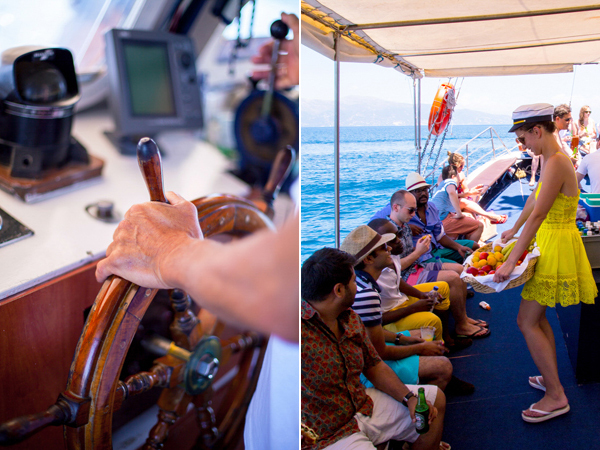 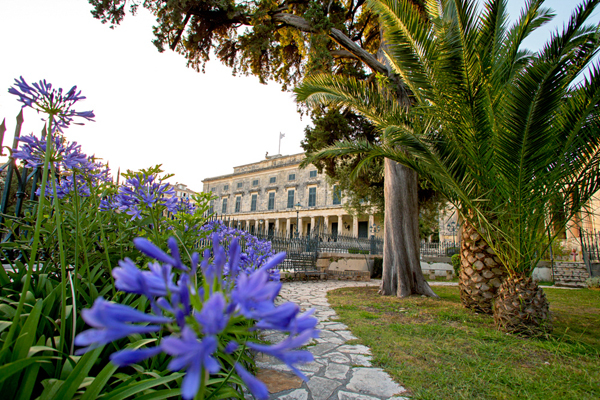 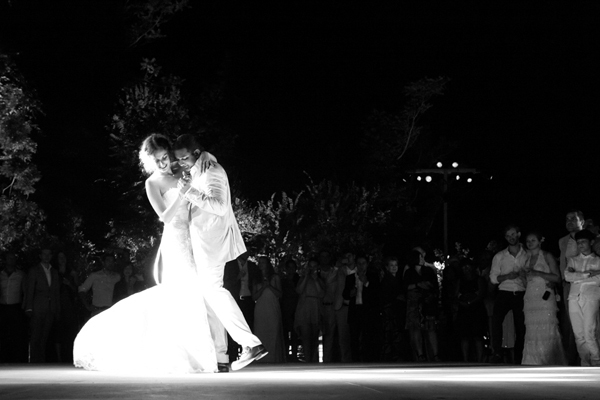 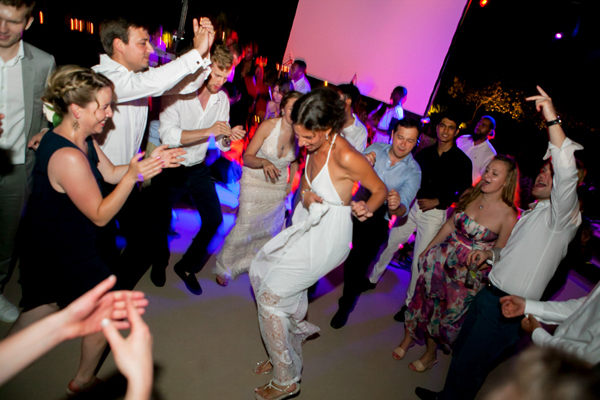 As the bride mentioned, they chosed the island of Corfu to have their destination wedding because: “… my family and I used to spend our summers there for many years”. 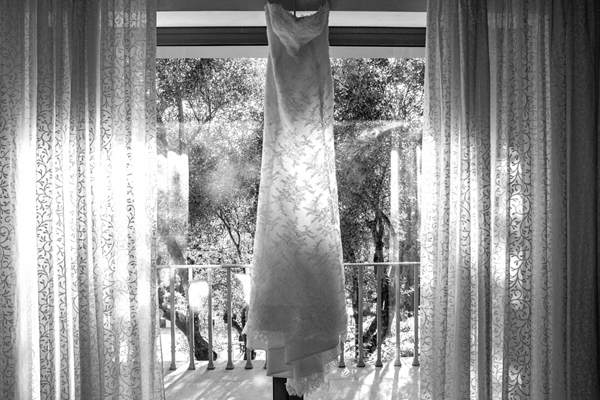 Kate’s stunning Oscar De La Renta wedding dress was a romantic a-line dress that according to the bride: “ Had none of the princess stuff… just simple and romantic”. 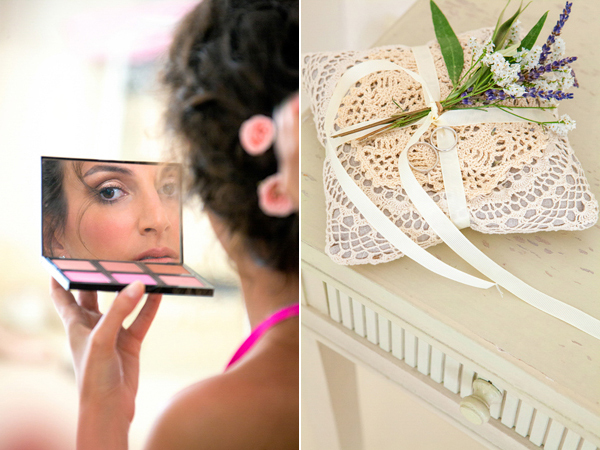 The bridal hairstyle was simple and oh-so-chic: softly pulled back in a loose bun. 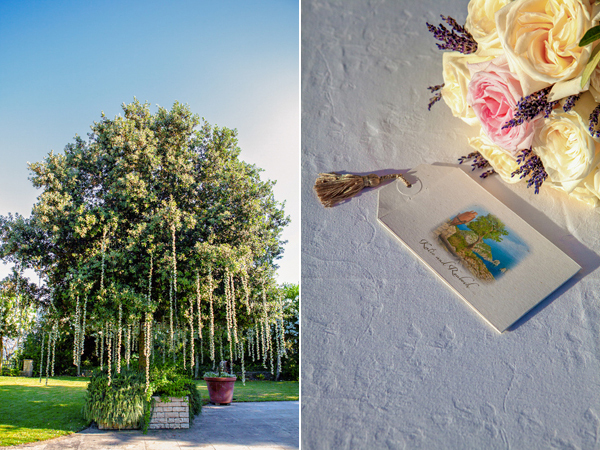 With impeccable sense of attention to detail, wedding planner Anna Sourbati really created a heavenly wedding scene: “In order add prettiness to the large trees in the villa’s garden, we hung limomium floral garlands and rows of fairy lights to create a dreamy setting… We arranged to have small mason jars with lights in the surrounding area”. 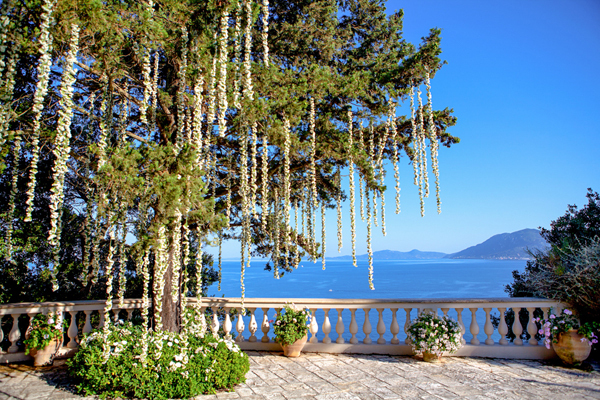 “In the villa garden, there is a beautiful fountain with a fascinating view of the Ionian Sea. 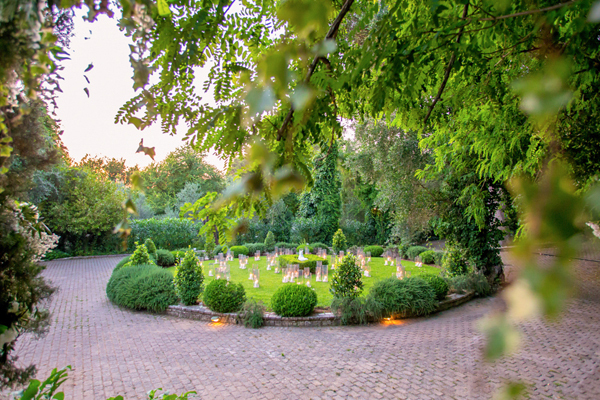 That is where the ceremony took place. 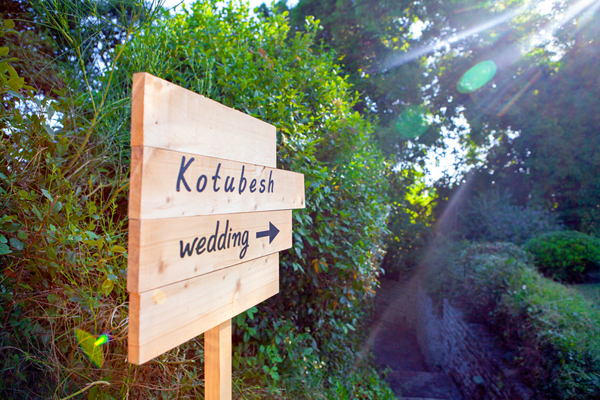 We made a kiosk from birch wood that was specifially sent from Holland for the wedding. 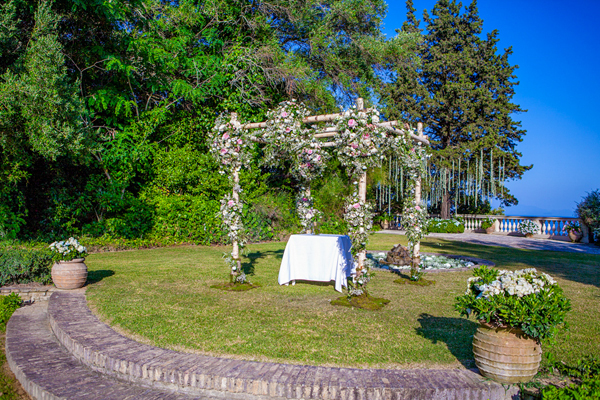 The pergola was decorated beautifuly with white wisteria”. 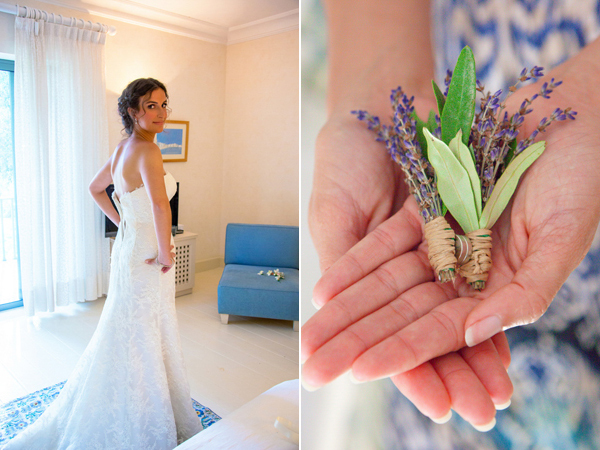 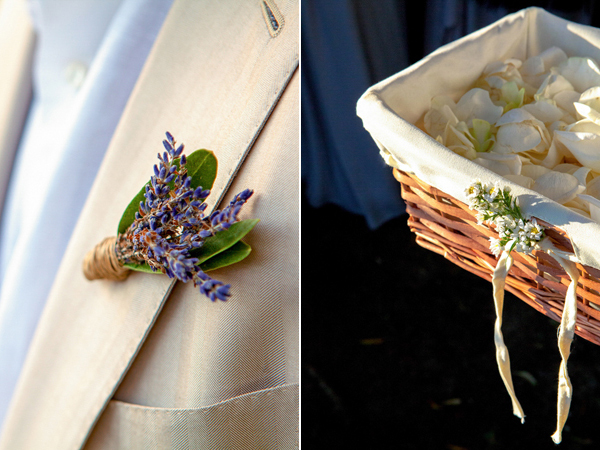 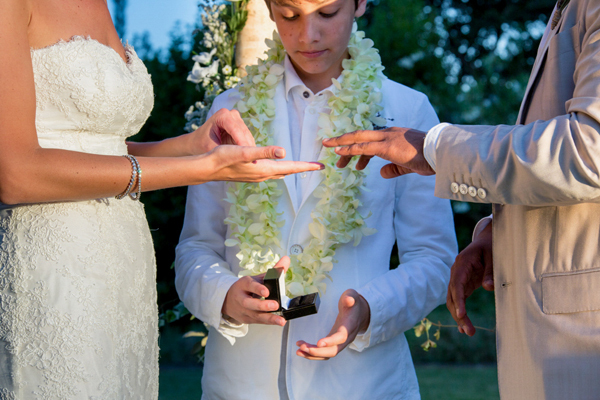 “The boutonnieres as well as the bridal bouquet included the bride’s favorite flower: lavender”. 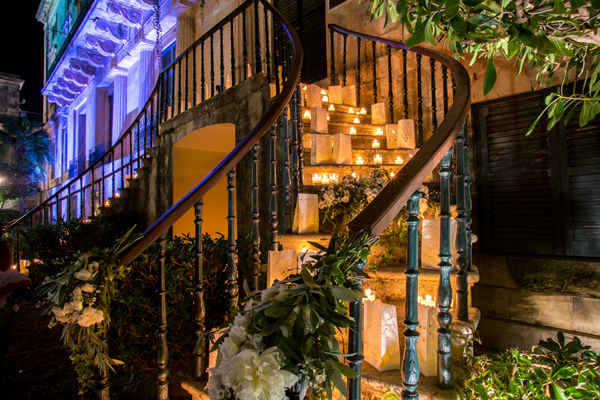 “The lanterns were filled with fairy lights instead of candles to create an enchanted feel”. 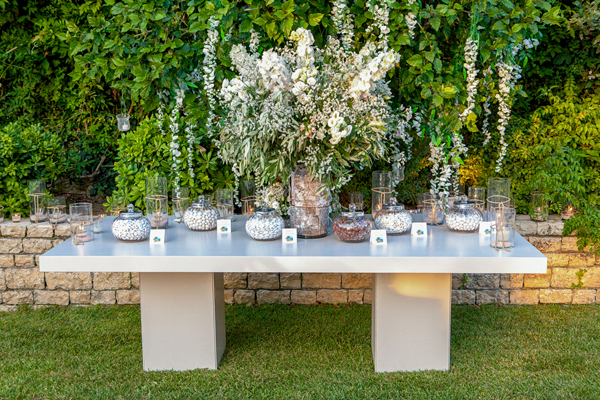 “The idea was to create a Greece inspired floral decoration with small olive tree branches that were enhanced with pink button roses, white aster, solidago and limonium. 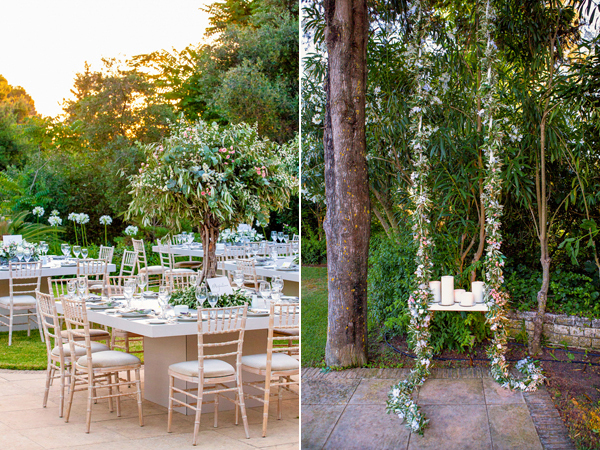 To add a romantic touch half the floral arrangements were trees and the other half had natural tree bark. 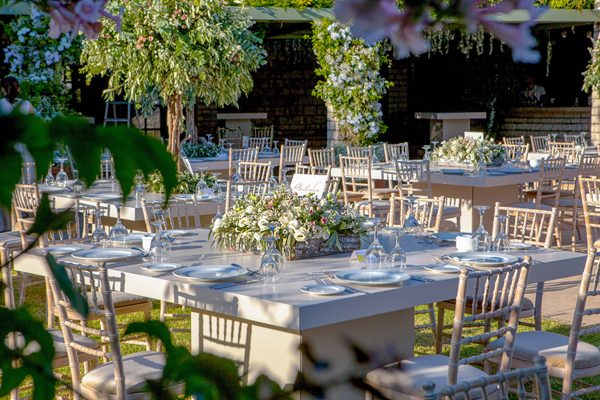 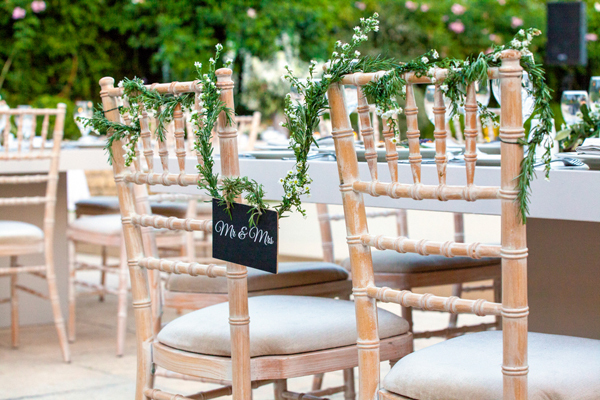 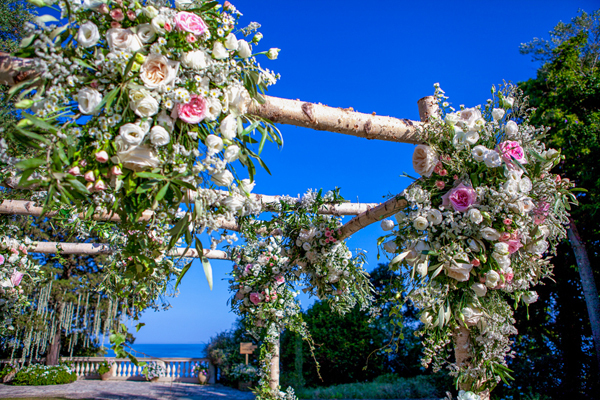 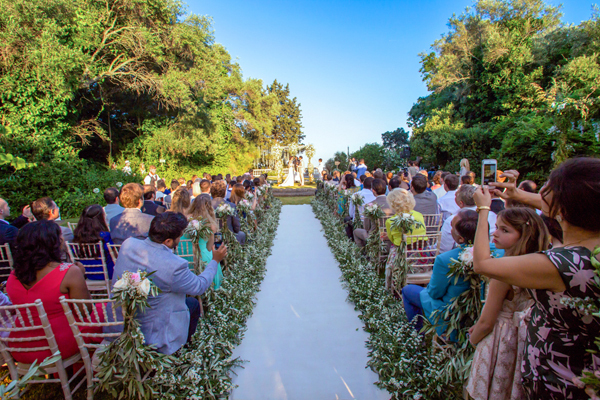 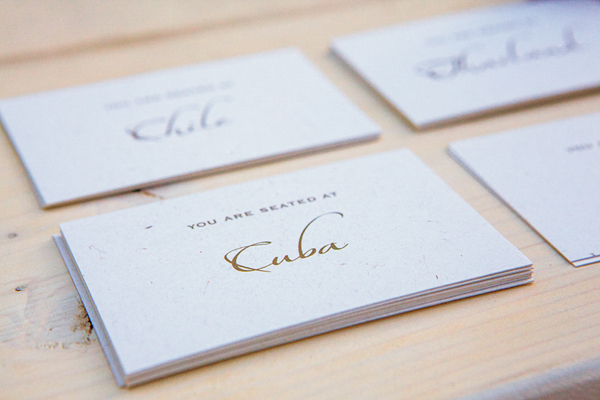 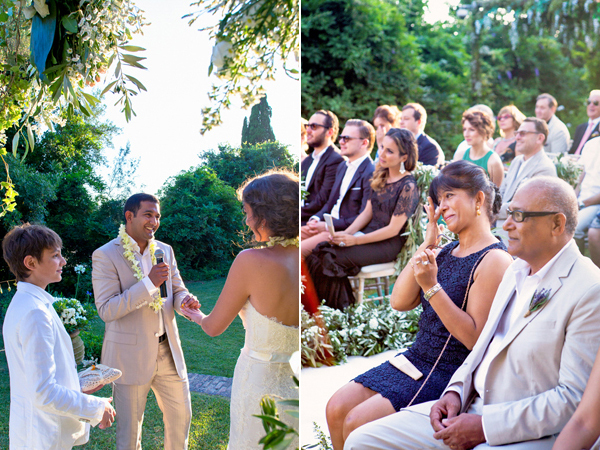 The chairs were adorned with rose bouquets, tender olive branches and rosemary. 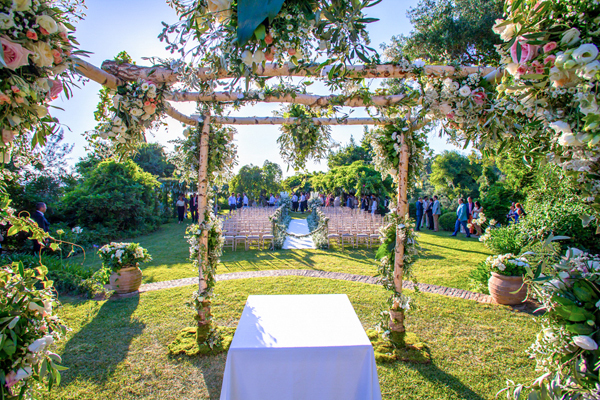 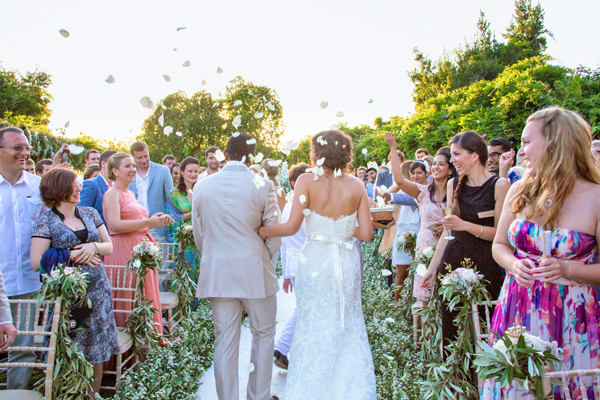 At the ceremony, the aisle was decorated on both sides with olive garlands. 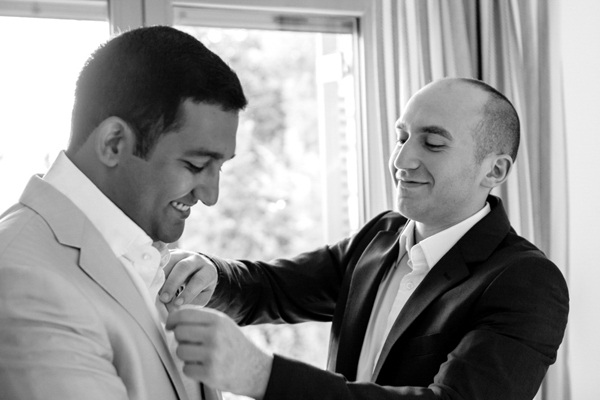 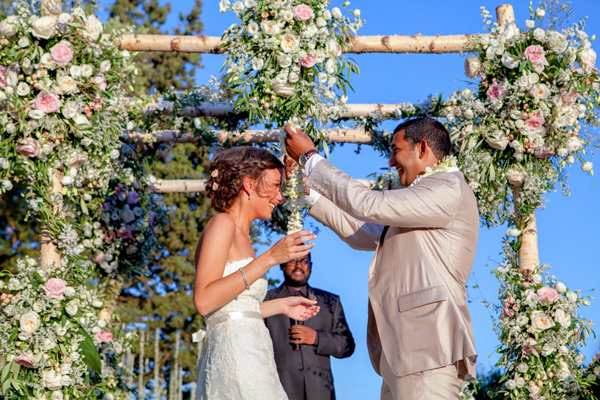 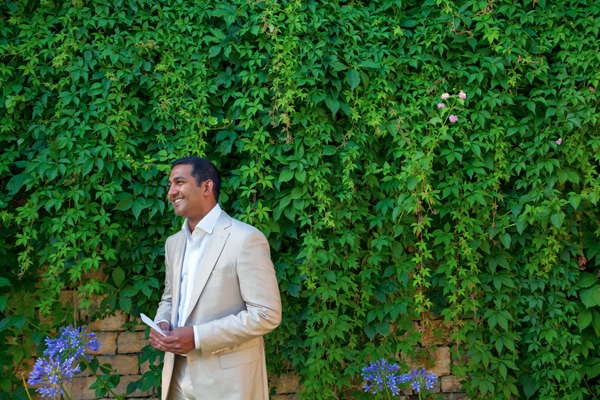 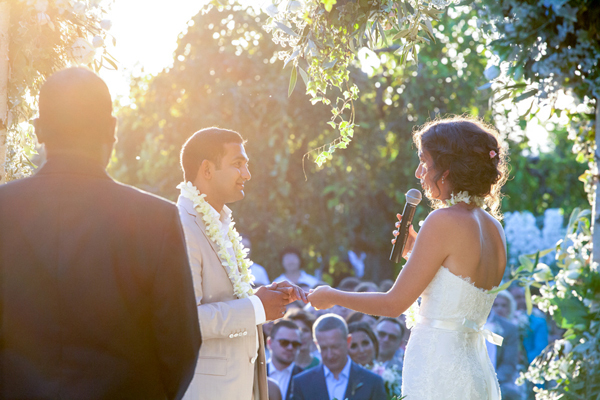 Also, since the groom is from Indian descent, we included an Indian wedding tradition where the grooms places white orchid garlands on the bride”. 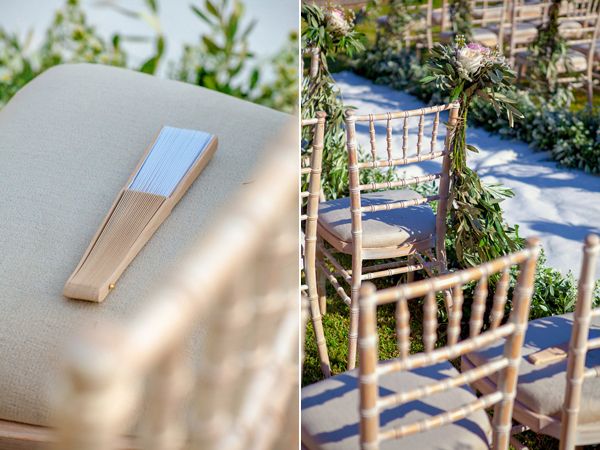 Mr & Mrs wedding chair signs were decorated with rosemary and aster.